Good double shot of the early MC Hammer. The original Ring 'Em is probably better from his Let's Get It Started LP but this version is more DJ friendly. Turn This Mutha Out was a really must have when I first started DJing in the '88 (along with Don't Stop The Rock by Freestyle). I would say most of the early Hammer is very good until about 1990. Both tracks are reworkings of the original songs found on the LP 'Let's Get Started'. I personally find the original versions much better. These versions are layered in additional samples that come off sounding very dated by today's standards. Particularity the canned audience effect on the A side. 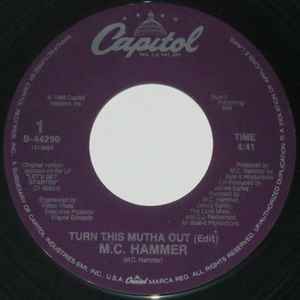 Mc Hammer is wack - but this 12" is nice! The LP version of "Turn this mutha out" is okay but the 12" version is much better. Here he uses the Apache (Incredible Bongo Band) sample and it rocks. Hammer wasn't that bad in the beginning.